Empathy: Learning to see the world though others perspectives. Hoerr suggests that many schools have fallen into the trap of reducing student success to numbers and performance. In order to "prepare students to succeed well in life, not just do well in school," there needs to be a cultural shift, whereby grades are considered the floor, not the ceiling. To thrive, students need to develop attributes that aren't typically measured on standardized tests. 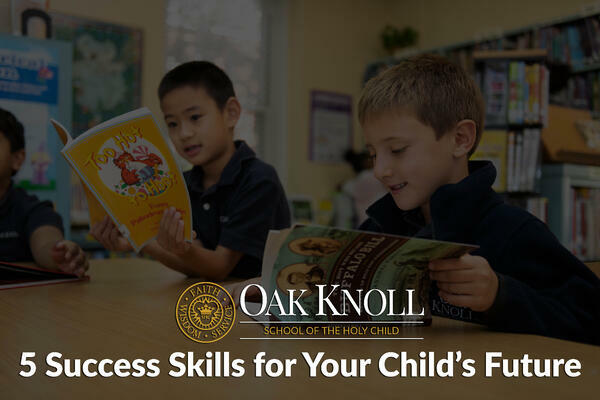 At Oak Knoll School of the Holy Child, we're constantly reinforcing “the formative five" success skills with our students throughout the year. Special assemblies are planned surrounding each theme, but the concepts are also woven throughout daily activities and the curriculum such that students are often unaware that social and emotional lessons are taking place. The skills are a natural component of the school's culture. Grades are still used to measure certain aspects of performance, but we are increasing our emphasis on understanding and developing the five success skills. By actively engaging in activities that foster the "formative five," we are raising expectations for student learning and preparing them for life-long success.